This implies that not only will friendship make you happier, it will also do more for your health than dieting and exercise. So, the best thing you can do for your health, both mental and physical, is to go out and make some friends. But how to know what sort of friends to make? Some people say that their “friends” bring them down, and make it harder for them to make good decisions. Sometimes “friends” get people into drugs or gangs, while other so-called friends are simply there to use you. These are not real friends. A real friend is one who wants the best for you, who genuinely cares about you, and would be sad if something bad happened to you. Having real friends of various sorts can make your life more fun, more fulfilling, and can also provide you with a valuable safety net, protecting you from dangers as widely varied as depression and financial setbacks. Fortunately, friends come in all shapes and sizes, and can be any age. 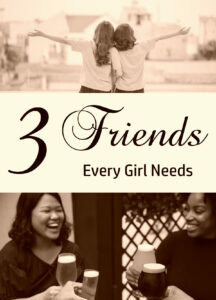 They also come in various types, and every girl needs at least one of each of these three types. The buddy is the one you first think about when you think of a friend. She’s the one you call if you’re sad, the one you hang out with wherever, the one you go to the movies with. You go shopping together, and when you get married, she’s the one you’ll want to be the maid of honor. If you’re lucky, she’s your roommate. She’s the one you share ideas with, the one you tell your dreams, the one you laugh with. Live reasonably nearby, or at least be available to talk frequently. Be able to keep secrets. Be enjoyable, and enjoy your company. Know how to make you laugh at yourself. Like some of the same activities that you do. It’s important for every girl to have at least one buddy. The Big Sister is a more experienced woman that you can go to for advice. know more about (at least some part of) life than you do. be someone you can feel comfortable asking awkward questions. The Big Brother is a male friend who has no romantic or sexual intentions toward you. If you’re lucky, you have an actual brother who fills this position in your life. Sometimes a cousin or friend can do it too. This is the person you call when you want a male opinion without a personal bias. He might also be the one you call when you need to move your furniture, are afraid someone broke into your apartment, or if you need advice buying a present for a boyfriend. He’s also helpful for chasing away unwanted attention from other men, if you happen to need help with that. Care about you in a brotherly way. Each of these friends plays an important role in making a girl’s life happier and more fulfilling, and giving her a wider understanding and experience. Each of them is worth the time it takes to either find one or become one. Cast iron is making a comeback. No longer is the cast iron pan just some mysterious blackened old thing you saw at your grandmother’s house, or at the old neighbor’s estate sale. A cast iron skillet is an important part of any well-equipped modern kitchen. Here’s a few reasons why. Cast iron takes awhile to heat up, but once it’s hot, it’s very hot. A cast iron skillet is an economical alternative to having a flat-top grill permanently installed in your kitchen. The thickness of a cast-iron skillet allows it to store up a lot of thermal energy from the burner, and so throwing meat into a pre-heated pan doesn’t cool it down much. The pan stays hot even after the meat is seared on one side. This lets you get the scrumptious seared look on both sides of your meat, without having to leave your own kitchen or spend a fortune on home improvement and difficult to maintain grill surfaces. It’s also ideal for grilling vegetables. All you have to do is preheat a few teaspoons of your favorite cooking oil in the bottom of the skillet, and throw your sliced fresh vegetables in. The hot pan stays hot after the vegetables are added, and so instead of the boring, soggy, or burnt vegetables that you might get from a thinner pan, With just a little stirring, you’ll be able to serve deliciously caramelized ones, in just a few minutes. While some of the concerns about non-stick pans are thought to have been overstated, (according to the FDA, the chips of Teflon that flake off an old or poorly maintained pan won’t actually poison you, but just pass through your body harmlessly) it is generally agreed that overheated Teflon pans do release harmful vapors when heated over 500 degrees. Cast iron, on the other hand, does not have flouride compounds involved in its construction, and so can be heated to higher temperatures safely. About the worst thing that’s going to come off your cast iron pan if you make it too hot, is a little smoke from the oil it was seasoned with. If you have a jumpy smoke detector, it could be a nuisance, but it isn’t likely to cause any health problems. Some recipes call for starting on the stove top, and finishing in the oven. Most skillets have insulated handles, however, and these don’t hold up well to oven temperatures, however nice they are for holding onto while in use on the range, and conversely, most baking dishes for the oven will crack or burn the food if put directly over a flame or heating coil. Cast iron, however, has neither of these disadvantages. There’s a reason why cast-iron pans have been around for so long. It’s partly because once there is a cast-iron pan, it’s going to be around for awhile, and some people even say they are better the older they are. There’s only a few things that can permanently damage your pan. One of them is dropping it onto a hard surface. This can sometimes crack a cast-iron skillet. It’s not too great for any of your other kitchen tools either. Heating it up really hot in a bonfire, and then throwing cold water on it. Leaving it in the rain and sun for several years until it rusted through. Pouring hydrochloric acid into it and letting it sit for awhile. As none of these are things that are likely to happen by accident, except dropping it, your pan should be a pretty safe investment. What is a bit more fragile is the “seasoning” or thin coating of polymerized oil that builds up on a pan that is used frequently. Most new cast-iron iron pans you can buy today come “preseasoned” but the seasoning will improve considerably with time and proper use. To properly care for the seasoning of your pan, it is recommended that you don’t let it soak in water, and don’t simmer acidic things, like tomato sauce, in the pan. Even if you do damage your pan’s seasoning, however, it’s not too hard to reseason it. Lodge, a distributor of cast-iron cooking tools, recommends oiling your pan and baking it upside down on the top rack for an hour at 400 degrees F.
Regular care of your pan is simple as well- wipe it out, scrubbing with water, or without to get any food that might be stuck on. When the inside of the pan is clean, simply dry it and rub some oil over the inside to keep it from rusting. 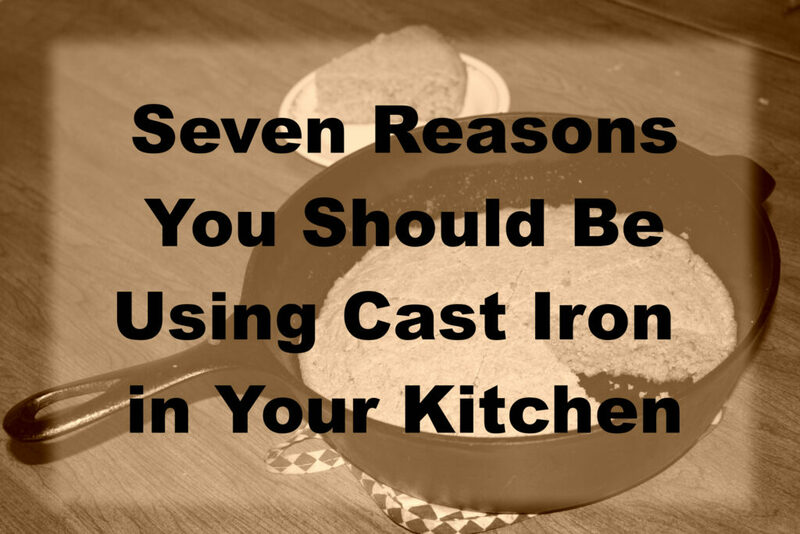 Another reason to use cast-iron is just the way it looks. It’s got a sort of vintage feel to it, and it’s sort of cool to think that you’re cooking with the same sort of pan as some of the pioneers on the Oregon trail. Who knows, if you got your pan at an estate sale, or from your grandmother, maybe it’s even the same pan! Who doesn’t want to develop a little more arm strength? With a twelve inch pan weighing in at over eight pounds, just ordinary cooking can help you develop wrist strength and tone your biceps. Just remember to use both hands so as to have symmetrical development. And finally, my favorite reason for using cast-iron pans. I love corn bread, especially with chili. But most cornbread is only half corn, and some aren’t even that! The rest of the flour is usually wheat based, and for someone who can’t eat wheat because of allergies, or someone who is going gluten free to lose weight or for other reasons, this is highly inconvenient. But Joy of Cooking, a wonderful cookbook, has a recipe that calls for only corn meal. And, you might be asking, what does this have to do with cast iron? Well, corn-only bread, if cooked in a standard pan, collapses and becomes a dense and unpalatable mess at the bottom of the pan. This is because there is no gluten present to maintain the structure when baking powder makes gas bubbles in the batter. Instead, the gas bubbles escape entirely, leaving behind a solid mass which cooks into something resembling a rubbery brick. The alternative? Preheat a cast iron pan in a 400 degrees F with butter or other shortening in it for ten minutes. Pour the batter in quickly and replace in the oven. The pan’s heat will cook enough of the batter to trap the air inside, and allow for a fluffy but gluten free corn bread which is inexpensive and delicious.